Apparently you can't teach an old dog new tricks, and neither can you teach a cat. But hogwash we say! Regardless of age or species, we believe any companion animal can learn new skills and master the moves if given the correct guidance. Even the proud feline who cares less about wanting to please and more about sampling the tasty morsel in your hand, has the intelligence and willingness to learn, so long as you have the time and treats to teach him. 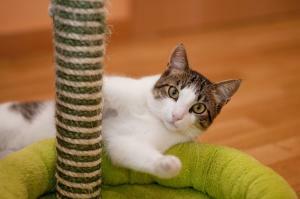 And just like dogs, cats can benefit hugely from this kind of mental exercise and enrichment. So, if you think there's absolutely no way your kitten or cat would ever let you teach them something new, think again! All it takes is a lot of patience and a bucket load of edible incentives to see you through. Here are some of VioVet's 'top tips for teaching tricks' which we hope you can put into practice. 1) Choose a trick and stick with it. Whether you want your cat to sit, stay, shake hands, high five or jump through hoops, the more you practice, the better the outcome will be. Try opting for something your cat would naturally be inclined to do, such as sitting at your feet when you shake a bag of treats, or pawing gently at your hand to get your attention. In these scenarios, give the command word e.g. 'sit' or 'high five' along with a hand gesture and a treat. In time, your cat will learn to associate the verbal cue and gesture with the performed action, and the positive result of it all (the treat). 2) Start small and build up to something more complex. It's always good to start off simple and keep your training sessions short, otherwise your cat will quickly lose interest. It is certainly better to quit while you're ahead and resume training another day. Simple obedience tricks are great starting points and can be built upon the more they are repeated. Ideally, training sessions should be no more than 10 minutes daily. If your cat is in a particularly attentive mood, introduce something new or add a twist to an established trick and see how easily your cat incorporates it. 3) Keep your cat sweet with consistent rewards. Unlike dogs who will perform just to please you, cats usually need a bit more encouragement. For many felines, treats are the ultimate reward, but others are content just with verbal praise or a good scratch behind the ears. For the former, try feeding low calorie training treats to keep your kitty lean, and gradually introduce petting as an alternative reward. So long as you are consistent and always offer an incentive, your cat should quickly learn to follow your instructions. 4) Be prepared to adapt your training. All cats are different and what works for one cat might be not be effective for another. If you reward with treats, some cats will learn to follow the scent of your hands, which isn't ideal in many training scenarios. Other cats will be easily distracted by background noise, so do your best to keep this to a minimum. Try to keep your cat motivated during these short training exercises as once interest has been lost, that's pretty much it for the day! 5) Be patient. Whether you're trying to train a cat or dog, all training requires patience and perseverance. As long as you remember to keep your sessions short and always provide an incentive for performing the trick, eventually all your hard work will pay off. Cats especially need time to practice and make mistakes and, while one day they might perform to perfection, the next, their independent spirit will prevent them from paying any attention at all. How would you stop the cat asking for more and more treats - mine are already overweight!